WE ARE ENDING THIS SEGMENT ON HEALTH WITH A LOOK LOCALLY AT SPECIFIC POLICY THAT SHOWS HOW COMBINING MEDICINE WITH BUSINESS AT ALL LEVELS DOES NOT BODE WELL FOR THE PUBLIC. I THINK WE HAVE ALL SEEN THE SUBTLE EFFECTS OVER THESE FEW DECADES, BUT THESE INNOVATION CENTERS TIED WITH UNIVERSITIES PLACES THIS IN OVERDRIVE. IT ENDS PUBLIC HEALTH IN AMERICA. WHETHER IT IS UNIVERSITY RESEARCH ON GENETICALLY MODIFIED FOOD-----SCIENTISTS HAVE BEEN PRESSURED FOR YEARS NOT TO RESEARCH THE ILL-EFFECTS----OR RESEARCH ON THE DAMAGE MOBILE PHONE USE DOES TO THE BRAIN THAT NEVER BECOMES PUBLIC, WE ARE SEEING OUR HEALTH INTERESTS COMPROMISED IN ALL WAYS. FRACKING CHEMICALS IN WELL WATER AND AQUIFERS? NO PROBLEM. SEAFOOD FROM THE GULF COAST FILLED WITH CHEMICAL TOXINS. NO PROBLEM. EACH OF THESE ARE LIKELY LIES AND THERE IS RESEARCH HIDDEN AWAY FROM PUBLIC VIEW TO PROVE IT. THIRD WAY DEMOCRATS WOULD NOT TELL YOU THAT BECAUSE THAT DOES NOT MAXIMIZE PROFITS! IN MARYLAND WE HAVE A 'BOSS HOGG' ATTORNEY GENERAL, DOUG GANSLER, WHO WILL OPENLY FLAUNT HIS WILLINGNESS TO IGNORE WHITE COLLAR CRIME. HE ALSO WANTS TO USE A GENETIC MATERIAL DATABASE OF MARYLAND CITIZENS THAT WOULD INCLUDE ANYONE EVEN SUSPECTED OF CRIMES OF BURGLARY OR VIOLENCE. THESE TWO AREAS ARE OF COURSE A GUISE FOR WIDESPREAD CATALOGING. ONE WOULD SAY THAT ALL OF MARYLAND'S POLITICAL AND GOVERNMENT HEADS WOULD BE THE FIRST INTO THAT DATABASE! EVEN A COMPLIANT APPEALS COURT IN MARYLAND SHOT THIS DOWN....IT HEADS TO THE SUPREME COURT. THE ARTICLE BELOW ON THE FEARS OF GENETIC DATABASES IS REAL AND IT IS DISTURBING. THE IMPLICATIONS FOR HEALTH PRIVACY AND PERSONAL SECURITY ARE TREMENDOUS AND YET, IT IS AN ELECTED OFFICIAL IN MARYLAND LEADING THIS POLICY. LET'S LOOK AT BALTIMORE'S HEALTH POLICIES OUTSIDE OF THE FRAUD AND CORRUPTION TOWARDS POLICY. I WAS AT MORE THAN ONE MEETING OF BALTIMORE CITY COUNCIL MEMBERS WHERE THE COMMUNITY COMPLAINED OF MOBILE PHONE TOWERS ON SCHOOL BUILDINGS BECAUSE OF HEALTH AND SAFETY ISSUES. THEY ARE ONLY ON UNDER-SERVED SCHOOLS AND OFFICIALS CONSTANTLY TELL US THERE IS NO HEALTH ISSUE. WE DON'T KNOW THAT----THE RESEARCH IS NOT COMPLETE ON THIS ISSUE. WE DO KNOW THAT THERE IS REASON TO BE CONCERNED ESPECIALLY WITH VERY YOUNG CHILDREN. THAT CONCERN IS WHY MONEY -MAKING MOBILE TOWERS ARE NOT ON ALL PUBLIC SCHOOLS. THIS IS THIRD WORLD PUBLIC POLICY! I ATTEND MORE BALTIMORE CITY COUNCIL MEETINGS AN HEAR COMMUNITY MEMBERS COMPLAINING ABOUT THE CITY'S DEFUNDING OF THE COLLECTION OF DEAD ANIMAL REMAINS. AT A TIME OF COMBATING RATS WITH POISON ALL ACROSS THE CITY WE HAVE THE PROBLEM OF DEAD RAT BODIES LYING EVERYWHERE. WHAT WAS INTERESTING THIS ONE TIME WAS THAT THIS QUESTION WAS POSED DIRECTLY TO THE BALTIMORE HEALTH COMMISSIONER, DR. BARBOT, HARVARD GRADUATE. DR. BARBOT SUPPORTED THE CITY'S POLICY OF LEAVING DECAYING ANIMAL REMAINS IN STREETS AND ALLEYS BECAUSE, SHE SAYS, THERE IS NO PUBLIC HEALTH RISKS. YOU CAN BE ASSURED THERE ARE NO DEAD ANIMALS LYING IN AFFLUENT COMMUNITIES. THIS IS THIRD WORLD POLICY! BELOW YOU SEE A GREAT CAMPAIGN BY A CONCERNED PARENT IN GEORGIA. USING PUBLIC ASSETS FOR COMMERCIAL BUSINESS, WHETHER ADVERTIZEMENT ON BUSES OR FIRETRUCKS OR THIS MOVEMENT OF CELL TOWERS ON SCHOOLS JUST SHOWS AN ARROGANT DISREGARD TOWARDS THE PUBLIC. IT IS RIDICULOUS TO THINK WE SHOULD PUT UP WITH THIS WHEN ALL WE NEED IS THOSE BUSINESSES PAYING TAXES. THE POINT HERE IS THAT IT IS A REAL HEALTH AND SAFETY ISSUE AND PUTTING CHILDREN AT RISK SHOWS A MORAL DECAY. THE ARTICLE BELOW IS LONG, BUT IT IS INFORMATIVE AS TO HOW TO ATTACK THIS ISSUE. SAY NO TO CELL TOWER! The DEKALB COUNTY COMMISSONERS OFFICE is in the PROCESS of ISSUING PERMITS for CONSTRUCTION, WE MUST STOP THEM NOW! We have confirmation that the permits are in the Commissioner’s office waiting approval. This is our best chance at stopping the construction. T-Mobile is planning a 150 foot/15 story cell tower in our neighborhood on the grounds of the Margaret Harris Comprehensive School. FACT: Dekalb County Board of Education (BOE) chose Money Over YOUR Children’s Health and Safety! FACT: Deutsche Telekom, German parent company of T-mobile, has policy against installing towers near dairy cows in its home country recognizing the detrimental effects on cows. They don’t want the local milk or meat affected. Installation of cell towers near German children is unthinkable." FACT: There are 157 Cell Towers in a 4‐mile radius of MHCS thus this tower is not needed. FACT: This tower will reduce your property values, betwen 20 to 38%. On July 11, 2011, the DeKalb School Board voted 7-2 to erect towers at Briarlake, Flat Rock, Princeton, Narvie J. Harris, Smoke Rise and Jolly elementary schools; Martin Luther King Jr. and Lakeside high schools; and Margaret Harris Comprehensive School. Brockett, Medlock and Meadowview elementary schools were initially included in the proposal, but after petitions and complaints from parents and citizens, the School Board voted to remove these three contested schools from the proposal. According to reports on the deal, those schools that will receive towers are going to get a one-time payment of $25,000, followed by a nominal monthly fee (reportedly only $ 400 a month). Over the contract's 30-year life, T-Mobile will pay the school district around $2.3 million in rent. Construction is already underway in some locations – for example, at Lakeside High School. 1. Health Concerns for All: both local residents and the numerous students. o People within a 2 mile radius of cell towers are in the fallout zone have the greatest risk. o Cell towers pose many, many risks - not just radiation and cancer risks - but things like HAZMAT fires at the bottom, damage or injury from falling debris and ice, 24/7 access to your neighborhood by unknown contractors, lights, noise, copper thieves, damage to roads from utility vehicles, access roads that can become hideout locations for criminals to park. o Then there is the growing evidence of damage to cells and tissues that can lead to cancer. § 10 out of 14 peer reviewed studies show health effects from wireless base stations (as of end of 2007). o Research on mobile tower base stations and their impact on health. o The World Health Organization (WHO) named RF Radiation from cell phones /towers as class 2B, possible human carcinogen. Electromagnetic radiation consists of waves of electric and magnetic energy moving together (radiating) through space. Radio waves and microwaves released by transmitting antennas are one form of electromagnetic energy. They are called “radiofrequency” or “RF” energy or radiation. Often the term “electromagnetic field” or “radiofrequency field” is used to indicate the presence of electromagnetic or RF energy. RF RADIATION SHOULD NOT BE CONFUSED WITH IONIZING RADIATION, such as x-rays or gamma rays. RF fields have lower energy and therefore cannot cause ionization (potentially resulting in chemical changes) in the body. RF fields are non-ionizing radiation. Non ionizing radiation has lower energy and longer wavelength than ionizing radiation. It is not strong enough to change the structure of atoms it contacts but may be strong enough to heat tissue. Examples include radio waves, microwaves, visible light, and infrared. RF energy is a type of non-ionizing radiation. Other types of non-ionizing radiation include visible light, infrared radiation (heat) and other forms of electromagnetic radiation with relatively low frequencies. While RF energy doesn’t ionize particles, large amounts can increase body temperatures and cause tissue damage. Two areas of the body, the eyes and the testes, are particularly vulnerable to RF heating because there is relatively little blood flow in them to carry away excess heat. 2010 Study finds current ICNIRP RF safety standards in Europe (similar to FCC's) may be non compliant with existing safety standards, in respect to cell tower exposure, by G Verneeren (2010), The influence of the reflective environment on the absorption of a human male exposed to representative base station antennas from 300 MHz to 5 GHz. · Margaret Harris Comprehensive School for the severely DISABLED, & 500+ Students at Immaculate Heart of Mary school as well as 2 other private schools in the area. 2. Reduction In Property Values, up to 20-38%. The view of a 15-Story Tower on Knob Hill Drive ne and Belle Isle Circle on MHCS property. · Multiple components that can lead to structural failure & collapse. · Lack of due process regarding the private use of public lands. 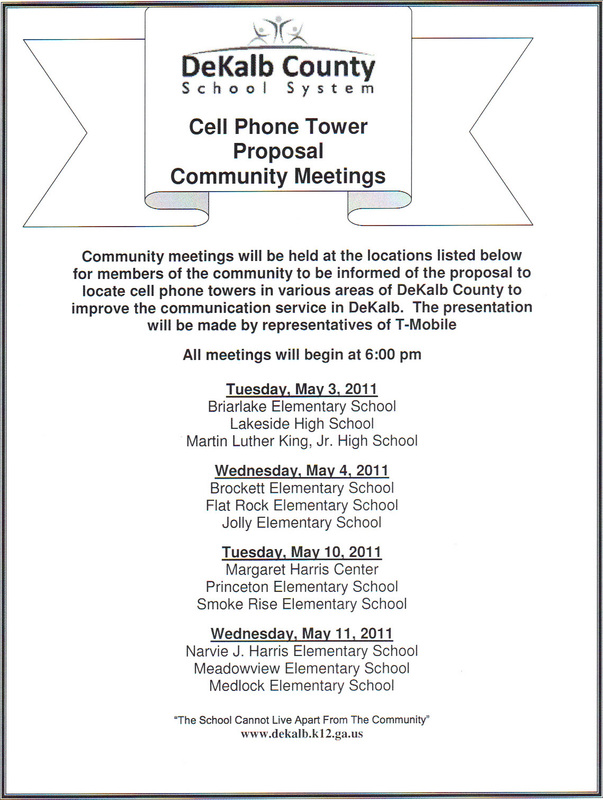 The School Board’s attempts at notification for the parents and local citizens consisted of a simple flier to discuss generally “the proposal to install cell phone towers in various areas of DeKalb County to improve the communication service in DeKalb.” This flyer does not include text indicating that cell towers would be erected at Margaret Harris or any other school. In an August 31 meeting with Briarlake Elementary parents, School Board Member Paul Womack agreed that this information was not conveyed in the flyer. This flyer was not distributed to the community at large, despite the fact that the title of the flier is “Cell Phone Tower Proposal Community Meetings.” No zoning or public sign notices were issued in the involved communities. When asked about the failure to notify the community, Mr. Womack replied that the school board held a seminar (presumably that noted in the flier, and given by T-Mobile): “We held a seminar here. We advertised it for a month. Put it on the website. The community was told, but everybody said, ‘oh it was the end of school, we didn’t have time’. We had about ten people that showed up for that presentation from T-Mobile. And I only heard one question during that presentation that was anywhere in voicing a concern.” On 25 October 2011, School Board Member Jesse “Jay” Womack admitted that the community surrounding MLK High School did not get adequate notice and agreed to take their concerns back to the other board members. 1. CALL EACH STATE & LOCAL OFFICIAL AT LEAST 3 TIMES PER WEEK!!!!! THIS NURSING HOME IS LOCATED IN THE MIDDLE OF A PLANNED AFFLUENT COMMUNITY. THE FUNDS TO UPGRADE THE FACILITY WERE WITHHELD AND THE RESIDENTS WERE EXPOSED TO YEARS OF BUILDING VIOLATIONS AS THE FACILITY WAS LEFT TO DETERIORATE. THAT IS AFTER ALL BALTIMORE'S APPROACH TO DEVELOPMENT....SEND NO MONEY TO EXISTING COMMUNITY AND THEN DECLARE IT UNSUSTAINABLE. THE CITY IS MOVING TO IN-HOME NURSING CARE SO FACILITIES LIKE THIS ARE BEING CLOSED. IT WILL BE THE LOWER/MIDDLE-CLASS WHO WILL FIND THIS DIFFICULT TO IMPOSSIBLE. REMEMBER, MARYLAND IS THE WEALTHIEST STATE IN THE COUNTRY SO THIS DEPRIVATION IS ONE OF CHOICE. CENTRALIZING CARE SEEMS TO BE MORE COST EFFECTIVE UNLESS YOU INTEND TO LOWER CARE LEVEL EVEN MORE. RESIDENTS VALUE LIVING IN THEIR OWN NEIGHBORHOODS. Harborside Nursing and Rehabilitation Center in Baltimore… (Baltimore Sun photo by Karl…)August 30, 2012|By Yvonne Wenger, The Baltimore SunNearly 70 elderly patients and vulnerable adults must find new homes because of the planned closure of Harborside Nursing and Rehabilitation Center in Baltimore, a sprawling facility with numerous fire hazards uncovered in a recent state inspection. The nursing home — the first in Maryland to accept AIDS patients in 1985 — will shut down within the next month after Medicaid and Medicare stop paying for patient care. The federal health care programs decided to cut off funding after a March inspection by the state found more than 30 safety violations, primarily due to structural problems. The company that owns Harborside, Baton Rouge, La.-based Ravenwood Healthcare Inc., filed for bankruptcy in April and put the facility up for sale. With no buyers and facing the loss of payments for patient care, the company decided to shut down. "Originally constructed as a hotel, the building's age, layout and structure posed problems, both in terms of day-to-day operations and compliance with modern nursing home building code standards," said Cindie Pittman, Ravenwood's chief financial officer, in a statement. "Ravenwood Healthcare Inc. lacks the financial resources to modernize the building and to continue absorbing the mounting operating losses." Ravenwood operated the nursing home, at the corner of Paca and West Franklin streets, since 1996, Pittman said. Eric Moss, 54, and his mother, Lois Henry, said they're upset by the way the closure has been handled. Although residents have 30 days to move, Moss said he and other residents were made to feel that they needed to leave immediately. Residents were told last Friday that Harborside was closing, Moss said. "I feel for the people who might not have a place to go," said Henry, 81. "I thought it was terrible that they waited until the last minute. Everyone is upset because they don't know what the next day will bring." Moss, whose leg was amputated about two years ago, suffered a stroke in March and lost much of the mobility in his right hand. "It's bad for everyone else; it's good for me," said Moss, who's looking forward to his move to a Genesis HealthCare facility in Baltimore. Advocates are watching over the transition to ensure residents' rights are protected and that each of Harborside's 66 remaining residents finds a new home, according to Alice H. Hedt, Maryland's long-term care ombudsman. City ombudsmen have visited the facility daily. Leaving the facility will be difficult for the residents, Hedt said. "No matter how the facility has ranked on inspections, that is still the place the person lived," she said. "It's very important that the residents know they have time to make their decision and move and also that they have a right to choice. They shouldn't feel pressured to go to one place or another." Nursing homes rarely close, said Dori Henry, spokesperson for the state Department of Health and Mental Hygiene, which oversees the facilities. Clearview Nursing Home in Hagerstown was the last in Maryland to close, in 2006. State inspectors assessed Harborside between Feb. 29 and March 9 to determine whether the nursing home met standards for funding from Medicare and Medicaid, the government's insurance programs for senior citizens and low-income and disabled individuals. Among the 33 deficiencies identified were blocked doors and gaps in the ceilings and walls that would allow smoke to spread. Inspectors also found improperly stored oxygen tanks, residents' doors with noncompliant locks and improperly identified exits. Routine cooking set off a kitchen fire alarm, causing the Baltimore City Fire Department to respond. The property has a history of fires, including one in 1970 that damaged an air-conditioning tower, another in 1976 that injured four patients and a firefighter, and a third in 1987 that killed a 68-year-old woman. The two later fires were attributed to careless smoking. The building opened as a hotel in the 1960s. Soul singer James Brown bought it and renamed it the James Brown Motor Inn in 1970. Brown, who once owned a local radio station, occupied a 10-room suite on the fifth floor when in Baltimore. It was converted into a residential home for the ailing in 1972 and changed hands several times before Ravenwood took over patient care. Former resident Barrin Spivey, 43, of Arbutus said when he arrived at the nursing home from prison in 2008 with multiple sclerosis, he could not walk and could barely feed himself. He left about two years later able to walk and live on his own. "These staff people here are so genuine. They care," Spivey said. "For this facility to be shut down is so wrong." It's unclear what will happen to Harborside's staff. The nursing home notified the state this week that it let go 71 workers in a round of layoffs that took effect Saturday. Several workers declined to talk outside the facility on a recent day. The state health department worked with the company to keep Harborside operating, but a plan to correct problems at the facility was unacceptable, said Henry, the spokeswoman. The state recommended that the federal government terminate Harborside's participation in the Medicaid and Medicare programs. That termination will be effective Sept. 17, according to Lorraine A. Ryan, a spokesperson for the Centers for Medicare and Medicaid Services. THERE IS NO DOUBT THAT GENETIC SEQUENCING WILL BE USED TO EXCLUDE PEOPLE FROM HEALTH CARE INSURANCE....IT WILL BE USED TO END PREGNANCIES DUE TO FEAR THAT MAY BE MISGUIDED....IT WILL SUBJUGATE PEOPLE IN THE TRACKING OF HUMAN CAPITAL THROUGH SCHOOLING....AND IT WILL PERPETUATE CRIMINAL RECORDS AND INCARCERATIONS. THE BENEFITS WOULD BE GOOD IN A SOCIETY THAT WAS JUST........BUT WE CURRENTLY HAVE SOCIOPATHS AT THE HELM SO IT IS VERY TROUBLING. IF YOU THINK THE FEARS BELOW ARE SCI-FI........THINK AGAIN. Ever since James Watson and Francis Crick cracked the genetic code, scientists have been fascinated by the possibilities of what we might learn from reading our genes. But the power of DNA has also long raised fears — such as those dramatized in the 1997 sci-fi film Gattaca — which depicted a world where "a minute drop of blood determines where you can work, who you should marry, what you're capable of achieving." That was science fiction. Just three years later, President Bill Clinton announced that the once-futuristic dream of reading someone's entire genetic code — their genome — had become a reality. It took hundreds of scientists nearly a decade to painstakingly piece together the first real look at the entire human genetic blueprint. It cost $3 billion just to make that rough draft. Twelve years later, the cost of deciphering a person's genetic instructions has dropped faster than the price tag on flat-screen TVs. And the sequencing can be done much quicker. The Cost of Sequencing A Genome Over the past decade, the cost of sequencing a human-sized genome has dropped dramatically. Since 2008, those cost reductions have outpaced Moore's Law, a famous forecast predicting the doubling of computing power every two years. Technology that keeps pace with Moore's Law is thought to be in good shape. Instead of years, it can take just weeks. Instead of an army of scientists, all it takes is a new high-speed sequencing machine and a few lab techs. Instead of billions, it can cost as little as $4,000. And many are predicting the $1,000 genome is coming soon. "It's incredible to me today to see how far we've advanced," said Robert Blakesley, who directs the National Institutes of Health's Intramural Sequencing Center. One company is showing off a sequencing machine that looks like a fat thumb drive, plugs into a laptop, and supposedly spits out a sequence directly from a little blood within hours. Some doctors are starting to sequence cancer patients to find the mutations behind their tumor. Oncologists can then sometimes find better drugs to treat them. Other specialists are using sequencing to diagnose mysterious genetic conditions. And some healthy people have even started getting sequenced just out of curiosity. "It is not theoretical or futuristic. It is today. And it is everyone," said George Church, a Harvard geneticist who started the Personal Genome Project. The project is trying to recruit thousands of people around the world to get sequenced and post their genomes on the Internet, along with as much detailed personal information as possible. "We are hoping to get a preview of personalized medicine — and share that preview worldwide," Church said. How Genome Sequencing Works It used to take hundreds of scientists years and billions of dollars to analyze one genome. Now high-speed sequencing machines can read a genome in weeks. All genome sequencing machines are designed to make sense out of DNA. DNA is made of two complementary, intertwined strands that fit together like two sides of a zipper. Each strand is written in a simple language composed of four letters that stand for different nucleic acids: A, T, C and G. The letters always pair the same way: A goes with T; C goes with G.
To decode the letters in a piece of DNA, a sequencing machine figures out what letters stick to the DNA. Here's how one sequencing technique works. With the price approaching the cost of getting an MRI, many predict that sequencing will soon become part of routine medical care. "You can imagine a day when our skin cells, for example, are screened periodically, and their genomes are looked at automatically as part of our life for signs of skin cancers, so we can better understand whether or not a particular part of our body is turning cancerous," said Nathan Pearson, a geneticist at Knome, Inc., a Cambridge, Mass., company that interprets genomic information. But the idea of widespread sequencing is setting off alarm bells. How accurate are the results? How good are doctors at interpreting the results, which are often complicated and fuzzy? How well can they explaining the subtleties to patients? The fear is that lots of people could end up getting totally freaked out for no reason. And there are concerns about privacy. Scientists recently even sequenced a fetus in the womb, raising the possibility of everyone getting sequenced before or at birth — a prospect with a whole new set of questions and concerns. "I think there are lots of population-wide and individual dangers," said Mark Rothstein, a bioethicist at the University of Louisville. "We're basically not ready for a society in which very exquisite, detailed genomic information about every individual, potentially, is out there." Despite the concerns, it's clear that more and more people are going to be getting their genomes sequenced. The question is: Is society really ready for this flood of genetic information and everything that comes along with getting to know our genomes so well?